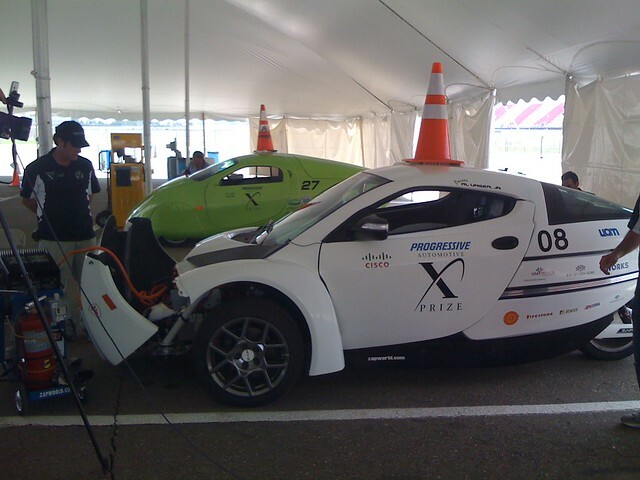 Over the course of the Progressive Insurance Automotive X PRIZE, the teams posted blog entries about their successes, challenges and progress in the competition. Some teams even provided insight about what motivated them to participate in such a difficult contest. A number of posts really captured the spirit of the competition, and provided a personal look into what inspired these incredible teams. We wanted to highlight a few of these blog posts, in order to more widely share their vision. We hope that you will make it a point to visit their websites and keep track of what they are continuing to do to meet the long-term goals of the competition. This entry by Nate Knappenburger of Illuminati Motor Works first appeared on July 7, 2010. I have found a calling; I don’t know how it happened. I was working a pretty nice job when fate stepped in. I was going through life day by day then I read the Illinois Times Article “Eyes on the Prize.” I was curious about this group of guys building an X PRIZE car, and I wanted to help out in any way I could. Since I was not wealthy I offered my time not too much at first mostly because I was a not an experienced fabricator. I would make up for my initial limited commitment. Back then Seven was to be a series hybrid which is to say you plug in your car at night and the internal combustion engine is only used to extend the range of your battery pack. This allows you all the benefits of an efficient electric drive train while minimizes the problems of gasoline and battery vehicles. Long story short you use the internal combustion engine at its most efficient RPM to convert the chemical energy in the gasoline into electricity, and use this electricity to drive the vehicle. Series Hybrid Evaro from team FVT is a very good representation of this approach. Seeing what X PRIZE was requiring for gasoline powered vehicles sealed the deal, we didn’t have the time to develop Seven as a series hybrid. Somehow I fell into the role of electrical engineer. I had the schooling for electronics, but this project was a big test for me. I mostly was on my own to integrate the electronics systems to charge, propel, and communicate. Having never done this before I made some mistakes, and would do some things differently, but the car runs fairly well. At Shakedown is where I worked the hardest in my life using everything I could to get the car going. We were very pressed for time just finishing the car then getting it through tech required several sleepless nights building circuits on the fly, but we did it. Our drive system although beautifully engineered is cryptic to implement because the manual is lacking in thoroughness and has been translated roughly from Italian. We made it through Shakedown a bit shaken up. So what did I do after Shakedown? First order of business was to get the motor accelerating and regening the way it should. We got regenerative braking to work first then I figured out why the car wasn’t accelerating properly. Yes I think the car can accelerate to 60 in 15 seconds we nearly did it with 4 people in the car; that might have hurt our clutch come to think of it. After those kinks were figured out I had the brilliant Idea to rewire the car. We needed to place connectors on our components to allow them to be removed anyway. I was working on the wiring up until Seven left for knockout. I had to stay in Springfield to until the weekend; Kevin was able to get Seven through tech inspection with a little coaching. I worked every spare moment I had on Seven the only brakes were when people needed to work where I did, and on those days I would go home and sleep then come back after they were done. I only seen the sun come up a few times while still at the shop, but I had to get my stuff done I felt as though the team was counting on me. Now what, I found something I love do to, but I am in a place that doesn’t do it. There is no industry around Springfield. I have become a big fish in a small pond. What we need now is a benefactor to recognize our talent and provide the means to realize our potential. We have proven problem solving and design skills, now we are on the sideline waiting to be put into the game. I think I can speak for most of the team members, and correct me if I am wrong; we are looking to do this sort of thing for a career, and we are pretty damn good at it. This entry by Josh Spradlin of Illuminati Motor Works first appeared on July 4, 2010. “You miss 100% of the shots you never take.” I believe the great one Wayne Gretzky said that. That quote has stuck with me since the inception of this project. We took our shot. We put everything we had into it, and, in my eyes, we succeeded. Are we walking away with one of those gaudy giant checks for $5M? No. However we did what many could not or would not. We had the best MPGe numbers out of ANY of the mainstream entries at Knockout. That is fact. We surpassed the competition’s requirements in a stage that we only had to reach 2/3 of the ultimate goal. Think about that for a moment. A group of 7 normal folks from mid America accomplished the base goal of an international $10M competition. Our design was proven. Our aerodynamics work. Our weakness ended up being a standard OEM transmission, and we’re not even sure it was working properly when we smashed the 2/3 requirements for efficiency and range! We can only imagine what our numbers would have been if we had a proper and reliable transmission. That’s the dig. Imagine what we could have put on the track if we only had that one big sponsor. Save for that one mechanical twitch, I feel that we would have had the numbers to win the Progressive Insurance Automotive XPrize. I am a naturally pessimistic person. This project changed that for me. As our work moved forward, I grew confident. Every week we could see tangible progress to SEVEN. We went from an “against all odds” team to a one in three shot at taking the whole damn show. Our entire budget, from the chalk we used to draw on the floor, to feeding the team every night, down to the travel and hotels for the events, and building the entire car was, I’m sure, less than some teams spent on a single component of their cars. No excuses. No regrets. We did what we could with what little resources we had available. We will finish SEVEN. We will improve on our already proven design. We will fix what needs fixing, and we will exceed every requirement that we originally set out to meet. In the event that there is no winner in the Mainstream Division, we are taking a preemptive approach to be ready in case XPrize should decide to invite the Mainstream teams back for another shot. You have not heard the last of Illuminati Motor Works. You have not seen the last of SEVEN. Audere Est Facere! We did. This entry by Ann Cohen of West Philly Hybrid X (EVX Team) first appeared on their blog on August 1, 2010. I was born a Phillies fan in 1952. I lived through the heartbreaking pennant race of 1964, but I knew we could wait until next year. Sixteen years later, in 1980, the Phillies finally won the World Series. It was their first World Series victory in the 97 years since the team’s founding. Folks in Chicago have been waiting for 102 next years for the Cubs to win the Series. As a matter of fact, with exception of New York Yankees fans, most baseball enthusiasts have lived through countless sad Octobers. But every April, we are again filled with hope and anticipation. We celebrate the tremendous potential of spring and make our way to the ballpark with dreams of our victory this year. What happens if there is no next year? What if there is no more baseball? No chance for redemption? That’s the question the West Philly Hybrid X Team has been contemplating since our elimination from the Progressive Automotive X PRIZE in June. For three years we spent virtually every waking hour working on our X PRIZE entries. Quite a few nights were consumed by X PRIZE dreams and nightmares, as well. Then it ended. Just like that. No more X PRIZE. Our abrupt exit from the Michigan International Speedway created some time and space for us to reflect on our accomplishments and think about what’s next. Simon committed to slowing down our work so we could ensure the maximum amount of learning for the Team members. Instead of prepping for the World Series, we would play catch in the park and really work on our fundamentals. As a result, our summer program has been terrific. Half the crew is working on the cars, increasing their fuel efficiency. The other half is designing their ideal school. But, slowing down doesn’t really allow Simon to hit his sweet spot. Not at all. That’s why he found another competition for us. Of course, we will have two entries, at least. And that’s why I am working at night and blogging on Sunday. Who knew that our summer program was going to turn into spring training? Not me, that’s for sure. We’ll be sending you programs and scorecards soon. In the mean time, get your cold beer and your hot dog; get a seat on the aisle. Maybe next year…. This entry by ZAP first appeared on their blog in July 2010. The ZAP Alias and Wave II in the Final X PRIZE Race. The ZAP Alias, the most production-looking and production-ready electric car competing in the Progressive Insurance Automotive X PRIZE, has survived in a competitive, international field of 115 teams and 136 vehicles down to the final six electric vehicles remaining in the competition. Now it moves onto dynamometer testing at Argonne National Labs with the remaining 9 vehicles to validate the final efficiency numbers and declare a winner. 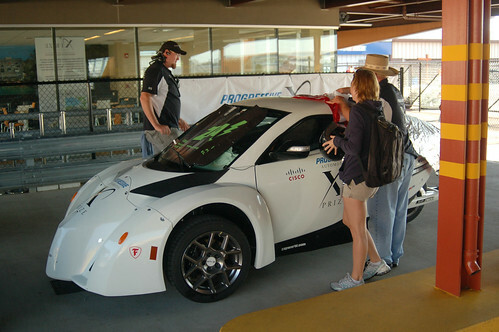 The ZAP Alias is in the most competitive class of the X PRIZE, the Alternative Side-by-Side category with two-seats in a side-by-side configuration. Other classes are Tandem seating for two and Mainstream for four. From the $10 Million purse contributed by Progressive Insurance, the two Alternative Classes are competing for $2.5 million each with the Mainstream Class for $5 million.Monotracer and Edison2, each with two vehicles, are the last teams in their classes, while the 5-team Alternative Side-by-Side Class is a dogfight to the finish. One of the most dramatic moments of the X PRIZE was a 100 MPGe “race” that Edison2 team leader Oliver Kuttner dubbed “The Race of the Century.” A time trial with five futuristic cars was held at Michigan International Speedway on Tuesday, July 27, 2010 as a tie-breaker in case more than one finished over 100+ MPG or energy equivalent. Competitors included our own ZAP Alias, the well-known Aptera 2e, the quirky, slippery Wave II from North Carolina, the powerful, expensive RaceAbout from Finland, and the tiny, minimalist TW4XP from Germany. ZAP’s car was driven by Chuck Turney, our master automotive builder who led the ZAP Alias build team from the beginning. Turney stepped in to drive without skipping a beat when team driver and Indy 500 winner Al Unser Jr. left to officiate an Indy Racing League event, a prior business obligation for which he regretted having to leave. An automotive genius who was integral to the success of the Alias, Chuck was cool and smooth in the driver’s seat as the Alias sailed effortlessly through efficiency, range and dynamic safety testing, passing each of the Consumer Reports safety tests on his very first attempt. Chuck was clearly one of the smoothest drivers in the emergency lane change and acceleration test and appeared to post the best 60 to 0 MPH braking test. Turney’s talent is the pride of ZAP’s engineering and we are all in his debt. The 100-mile, 50-lap “race” was non-elimination and included a challenging serpentine chicane on the backstretch to simulate real-world driving. The best time while achieving the 100 MPG or equivalent efficiency that passed validation in laboratory testing would be declared the winner. Teams were required to keep their speeds at 70 MPH or below and 45 MPH or above throughout the course, except through the chicane where cars passed through at speeds of 30-35 MPH and had to accelerate up to 45 MPH within five seconds after exiting. The circuitous chicane extended the distance of the course and taxed the cars far more than expected. The powerful Finnish team RaceAbout had a high degree of confidence going into the event with its expensive, 400-horsepower EV and was the odds-on favorite by some to win the competition with 12 team members calculating every move of their vehicle. The Alias, with super smooth Chuck at the wheel, pushed the pace and may have caused the Finns to exceed the 70 MPH speed limit twice during the event, earning penalties which ultimately cost them victory. The second favorite Aptera with its multi-million dollar 3-wheeler, a sophisticated, lightweight and aerodynamic design that began engineering in 2007, ran into technical problems on the first lap due to what appeared to be overcharging and regenerative braking issues, and completed just 18 laps before stopping. The aerodynamic, odd-shaped Wave II was 800 pounds lighter, and had sophisticated wind tunnel testing, which meant that the Alias was less efficient and needed to have luck, skill and strategy to win this race. The lightweight, minimalist TW4XP 3-wheeler ran conservatively to save energy, while in this all or nothing tie breaker event, the ZAP team went all out for the win. All of the other four teams received max and minimum speed penalties while the Alias with super-smooth Chuck behind the wheel roared on for 47 laps without any penalties at all. Several days before the race and up late each night, Gary and Prash calculated and recalculated speeds and times. We knew we would need skill, luck and ultra performance from the Alias. We were not the most powerful, nor the lightest, nor the most aerodynamic, so the laws of physics and simple math were not on our side. Carlo watched the action from his computer in Colorado, Sam had the lap times, while Dave and Alex counted down the laps. The only radio contact with Chuck was race-side through Ben. Early on the team mathematically surmised that the RaceAbout had over-sped the course. Indeed, following the race we learned they were penalized twice for going over 70 MPH. The laps continued to tick down. For much of the race the Alias was locked with the Wave II trading leads and then taking the lead towards the end. Up until that point, the Alias was spectacular throughout the X PRIZE, making it to the final stage against all odds. Confidence was high, but again, math was not on our side. As others have pointed out, it is a reality that the hyper-efficient, lightweight Wave II from Li-Ion Motorsmost likely would not have been in the finals without ZAP’s engineers lending them a hand and parts during the Shakedown. Some have said that it was wrong and a crazy thing to do. In this dog-eat-dog world it has often been pointed out by Progressive Insurance and the X PRIZE that sportsmanship rose high during the competition. At the X PRIZE leadership seminar it was pointed out that only through cooperation would these cars of the future really have a chance of competing against the current multi billion-dollar industry that represents the status quo. The reality was that ZAP had the part that another team desperately needed, and a decision was made to give it to them. Later, the Li-Ion Team helped another team that was struggling. Who knows how things would be different if that decision had not been made? But who knows where our auto industry would have been if they truly met the goals of the original the Partnership for a New Generation of Vehicles program which was suppose to cooperatively share technology and produce high mileage cars years ago? Or what happened to real cooperation on fuel cell technology? Would the Japanese have crushed us with hybrid technology that was originally invented in the USA? Would billion dollar government-sponsored programs like the fuel cell initiative, the Freedom Car program, and the electric car mandate of the 1990’s have died? Would the foreign car companies have out-produced and out-sold US companies? Would we have had to give them tens of billions of taxpayer dollars to bail them out? Who knows what the final outcome will be here, or who will recognize what really happened… But those who participated in this contest and those who were in the thick of it all know, what the ZAP team is made of, what they accomplished and what they did. As the Alias went for the win, ZAP could also not have anticipated that the challenging course would consume more energy than earlier calculated, and by keeping up with Wave II, that was more aerodynamic and 800 pounds lighter, apparently all it took was one of the Alias’ 110 lithium battery cells going so slightly out of balance on the 48th lap, our automatic safety systems went into effect, and the Alias started losing power when the controller reacted and the overworked battery pack sent a low-voltage signal for cutoff. The vehicle slowed and came to a stop just 2 laps short of its goal. In a gallant effort the team tried to re-boot and reprogram the system and unlock a small reserve of power, but time eroded and ran out. ZAP Alias electric car waiting to start the final X PRIZE race. Ironically our driver was so smooth with no penalties and the ZAP Alias performed so well, the math says we most likely would have won by going slower and conserving energy, and not racing the Wave II for the lead, but we couldn’t have known for sure at the time without a crystal ball, more engineering time, or simply a few more personnel on-site. The two most committed, serious teams RaceAbout and Aptera had many more engineers present throughout the competition. ZAP spent perhaps the least amount of capital of all the finalists, and was simultaneously engineering and constructing a vehicle for the USPS as well as a new lithium powered electric truck and an electric taxi for a venture in China, all at the exact same time as the X PRIZE events. Throughout ZAP’s Alias development, management at ZAP had a difficult time supporting a three-wheeled car. And progress happened through the will and persistence of a dedicated few. After crunching the numbers, the technicians concluded that the Wave II, which had only one low-speed violation, was named the winner of the potential tiebreaker over RaceAbout with two over-speed penalties.Wave II was declared the winner by an incredible 0.129 second margin! Both teams and all the rest should be congratulated for such an exciting finish and for their perseverance in this “Race of the Century.” Now the Alias remains in the competition with a wild card chance among the 7 teams remaining going onto the validation phase at Argonne National Labs. The ultimate winners will be named in Washington D.C. on September 16. ZAP is extremely proud of how the team pulled together with the support of our suppliers, (especially Carlo!) sponsors, employees, investors, family and friends. We need to thank the ZAP Alias Team for the X PRIZE: Al, Chuck, Prash, Dave, Gary, Joe, Aubre, Frederic, Ben, Brandon, Alex and others, including our fellow employees, volunteers including daughters, sons, brothers, and wives, many who have worked crazy 16-hour days in 95 degree temperatures for 7 days a week, some nights ’til 2 in the morning, some waking up at 4 am. We need to thank those who used their own finances and their own credit cards to float the expenses of this competition. Even the willingness of the team to share an old house without air conditioning instead of a hotel to save on cost. The Alias earned respect and admiration from competitors and officials alike, including the third-party recognition of the X PRIZE, Consumer Reports, and the Department of Energy. Our stylish, innovative, and practical three-wheeler outperformed many of the best three- and four-wheeled cars in the world, so we are extremely delighted with its performance. The Alias is now among an elite group of seven teams to survive the grueling three-year competition. Thank you to everyone for your support, including all our fans on Facebook and Twitter. And a special thanks to Al Unser Jr. and family for their support, helping to bring much more attention to the competition and providing a wealth of knowledge and experience to our team. All the teams involved in the competition deserve a huge amount of credit for having the audacity to believe in and achieve 100+ MPGe automobiles. One of the X PRIZE officials pointed out that the upcoming Nissan Leaf would not have been able to complete tests like this. Thanks to the event organizers and sponsors for executing the difficult challenge and mission of a 100 MPGe vehicle competition, including Dr. Peter Diamandis, Julie Zona, Bethann Budenbaum and countless others. The Tech Team, led by Steve Wesoloski, ran a tough but fair competition. Congratulations to all and good luck in the future. ZAP joined the X PRIZE in the middle of its preparations for finalizing the design of the production Alias. While the competition outlined criteria for production-ready cars over the next few years, ZAP’s goal is to go into production soon after the competition is over, which at this point we are projecting to be by 2011. For these reasons, it seems that the Alias matched the spirit of the competition more than it did the minimal rules that helped the other four cars. The Alias is heavier because it was designed with more safety equipment than the other cars, including a NASCAR-style chassis and safety cage. The competition vehicle uses double reinforced door panels to meet side impact standards. Some of the vehicles only had one seat or extremely hard, lightweight seats while the ZAP Alias used standard, low-cost, off-the-shelf, well-padded and comfortable automotive seats. The Alias also had off-the-shelf wheels, steering, braking, real automotive front and rear glass, defrosters and standard size tires and wheels. It was the combined solid engineering, experience and vision of the ZAP team members that allowed this low budgeted race vehicle to compete with the best. Due to the “I want one” look, the Alias is less aerodynamic and never had the sophisticated and expensive wind tunnel testing of the other cars designed solely for the competition. Instead it used an aggressive, futuristic styling that would be attractive to consumers yet still surpasses the aerodynamics of most conventional cars. The ZAP Alias was designed to win in the marketplace, not necessarily just win the X PRIZE like the majority of all other vehicles. It was believed that our goals of a production-ready, low-cost vehicle with good technology was a match for the X PRIZE rules, and so with little support, a 2-person, part-time team of Gary and Frederic filled out the original paperwork to enter and pass the early technical reviews. The Alias was created out of air, even when we were told that three wheel cars didn’t make sense and didn’t have a market. Two different senior management groups would not financially back the project. Even without any prior third-party analysis, or the funding or dedicated single focus of most of the other teams, the Alias still achieved an impressive 121.8 MPGe efficiency from the on-track testing, and had the least problems with the performance safety requirements. It also appears that it was the least expensively built race vehicle by several multiples, all keeping with the goal of a true production-ready car to ultimately prove through sales that it could be built affordably even in modest volumes, at the currently projected retail price of $35,000. For these reasons we would argue that the Alias is the best all-around car competing in the X PRIZE, which has been affirmed time and time again by third-parties, and by you, our fans. Thank you for voting the Alias as the‘Most Stylish’ car on the X PRIZE website, which is now up for ‘Most Practical’ through August 16. Vote today athttp://progressiveautoxprize.org. Don’t forget, you can also reserve a ZAP Alias today on ZAP’s website,http://www.zapworld.com. And look to see the ZAP Alias in Washington D.C. next month! It remains to be seen whether history will look back on the X PRIZE’s 100 MPGe “Race of the Century” and remember it in the same terms of the Wright Brothers, Henry Ford, Charles Lindberg or Thomas Edison. One thing is for sure, for those who were there and watching on U Stream that day, 100 MPGe cars put on an unforgettable show and won over more believers. Perhaps it will represent, not a finale, but a new beginning, knowing that the technology for 100 MPGe cars is possible. Perhaps this is the beginning of the real race – getting these 100 MPGe vehicles into production. ZAP is now proposing the formation of a new alliance, an alliance of these fuel exciting teams and vehicles to assist each other in creating these quantum leap vehicles. Join us. This entry by Azeem Hill of West Philly Hybrid X (EVX Team) is the text of a speech that he gave to the Congressional Black Caucus in September 2009. Good afternoon, ladies and gentlemen. Thank you very much for the opportunity to speak with you today. It is an honor. My name is Azeem Hill, and I am a member of the West Philly Hybrid X Team, a part of the West Philadelphia High School Automotive Academy. This is a wonderful after school program that I have been a part of since freshman year. I am now a junior and have been involved with the West Philly Hybrid X team for three years now. I am also a proud member of the Philadelphia Student Union which complements my involvement with the team because both organizations work towards building a solid educational portfolio. Every Tuesday, I meet with Simon Hauger and Ann Cohen, directors of West Philly Hybrid. Awaiting us are exciting projects and announcements that most recently connect with our entry into the Progressive Automotive X PRIZE, an international competition to build cars that achieve 100 MPG. We are the only high school competing in this world, in this world, for this multi-million dollar automotive competition for the green economy. We are competing against startup companies that have more money in their pockets than we do collectively. Our participation is no surprise to me because we are using an educational model that prompts and highlights every student's unique strengths. This is called project-based-learning. Years before I joined the team, this all started out as a science project that became cross circular within days. I got my introduction to the team working with the K-1 Attack where we put a fierce hybrid engine in the body of a sports car. Being at West has its challenges and my classmates have complicated personal backgrounds, but being on this team ignores all of this and pulls together all of our strengths. That is the reason why the K-1 Attack even exists, because one of our former team members said, "Hey Hauger, these hybrid cars are decent, but why are they so ugly lookin'?" Eventually the world's first hybrid supercar was born out of our garage in West Philly. We won the Tour De Sol, the nation‚Äôs oldest alternative fuel vehicle competition, with our K-1 Attack. The K-1 has a carbon fiber body that is superlight but tough as steel. It goes from 0-60 in less than 4 seconds and it even gets over 60 miles to the gallon on bio-diesel. We were able to beat schools like MIT and Toyota and Honda entries because of our knowledge of hybrid technology and our understanding of consumer needs and wants. For us, this was just a precursor for all that we have waiting for us, especially with our participation in the X PRIZE competition. For the current team members, the K-1 was our first love, it was our first hope. It was a stepping stone to the X PRIZE. The Progressive Automotive X PRIZE is a $10 million international competition to build clean, super efficient vehicles intended for mass production. The X PRIZE Foundation's mission is to spur innovation through competition. Our mission is to win. When we win we will secure a place in the green economy for young urban people. But we'll have more than jobs. Winning will show how young people have historically changed this country for the better. We have power. We've changed policy and now we'll change industry. Our two cars entries in the competition, the Ford Focus and Factory Five GT, will achieve over 100 MPG, emit less than 200 grams of carbon per mile into the air, and go from zero to 60 in under eight seconds. The mission of the X PRIZE Foundation is to benefit humanity and stem the effects of climate change through big competition. There were over 100 teams that entered in this $10 million contest. We know that after preliminary cuts, far less will remain. We are one of them. Five teams are invited to attend the launch party of the X PRIZE competition on October 19 in New York City. We are one of them. We have an amazing and effective business plan to bring our cars to production in Philadelphia. Continuing education and use of green materials is the thesis for our marketing plan. People are talking about us. I guarantee you by the end of my speech, you will be talking about us, too. Last year, the West Philly Hybrid X Team was rated number 10 in Popular Mechanics magazine as being one of the teams that will most likely take home the big pot of cash in the competition. Since then we've gotten heaps of press. The team was in Natural History magazine, Rolling Stone, and American Way magazine. The team was featured by local news outlets dozens of times. Even after EPA Lisa Jackson visited our school, she felt it necessary to mention our accomplishments to high school students in North Carolina when she was there visiting. We even have a documentary being made about us. The documentary will focus more on the students' lives than the hybrid cars. The press and media coverage is amazing and sincerely appreciated, but none of that compares to the critical thinking and humanistic skills my peers and I are constantly learning. It's been three years of studying, writing, debating, and headaches and I am proud to say I've been involved with the X PRIZE from the very beginning. Now that I look back on my experiences, this thought comes to mind: If you were to go back in time and ask me three years ago when I was a freshman what I was doing with the team I would say, "We are just building hybrid cars." There wasn't much depth to my understanding of hybrids or the green economy or even why we picked the batteries we picked. That was probably all I could tell you. Now, after learning about the cars from my fellow teammates, doing work on the cars, and participating in a 15 page research document on electric vehicles, I internalized our mission from having amazing real life experiences with the team. I was eager and excited to seek out new challenges. I liked the Philadelphia Student Union before I liked the team, but I learned both missions are intertwined and are solely about the progression of a student. They both help create students who can become part of the new global economy. There is a missing link for whatever reason in the classroom about preparing myself for this so called global economy. Our districts are underfunded, and fifty percent of our freshmen drop out before they reach sophomore and junior year. Before I joined the student union I thought that it was okay for people to drop out if they don't want to learn. But students are dropping out because their unique ways of thinking, working, and expressions are not being stimulated. They care about their education but even before they open a book, they are already failing. With the team and with PSU, I never felt like a failure. I felt challenged and pushed, but both groups allow me to work my best and open my mind to the bigger picture. This learning process was not a walk in the park. The EVX Team and the Philadelphia student union both believe that all young people can be leaders of tomorrow and sometimes that's a lot of responsibility. Sometimes I am responsible for teaching another young person how something works. Sometimes I have to convince another young person that personal life and personal drama needs to be left behind for the welfare of the group's progression. Sometimes I even have to let someone know that this is not like school when you can just not do something and get a bad grade. This is real life and you are making a real impact on the world and you are accountable for all of you actions and assignments you take upon yourself. Every step you decide to miss is an opportunity you've wasted not only for the team, but for yourself. I don't want to miss any opportunities. I know that you don't want to miss any opportunities either. The opportunity awaiting you is the purchase of a brand new super cool, super efficient, created by students, built in Philadelphia 100 MPG car. When we win seize your opportunity and buy our car. 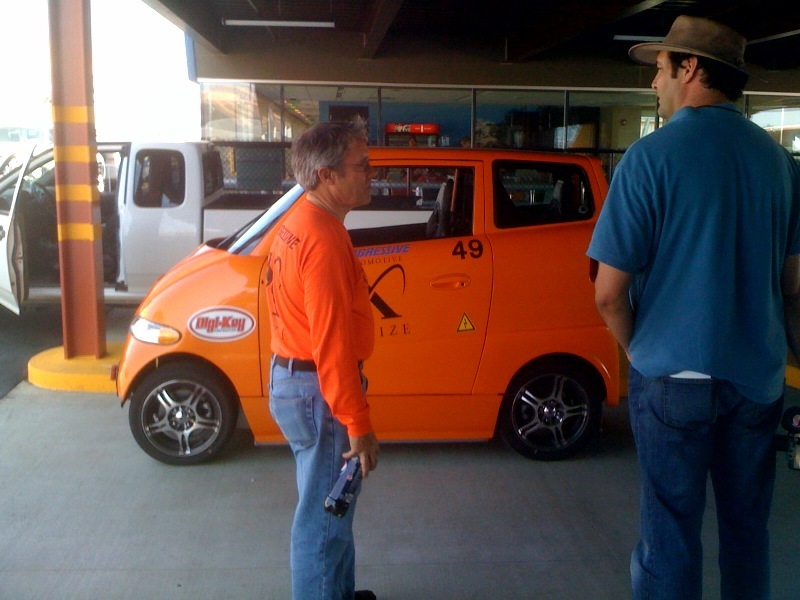 This entry by Rick Woodbury of Tango (Commuter Cars) first appeared on June 26, 2010. We are still contenders in the Progressive Insurance Automotive X PRIZE competition due to no small contribution from other teams and volunteers. We've now completed the first week of the Knockout stage which consisted of economy runs which require 67 MPGe (Miles Per Gallon Equivalent) and a range, in our class, of 67 miles at 60 mph. We completed these easily, of course, however, the urban and city driving cycles brought the Tango down to 86.8 MPGe due to lack of regen which we sacrificed in order to have the extreme torque of two series-wound traction motors. The Tango, being one of the heaviest vehicles in the competition, weighing in at nearly 3,300 lbs, (the same weight as a Subaru Outback) has a huge handicap for stop and go and a smaller handicap of rolling resistance. The Tango does have the benefit of half of a normal car's frontal area which helps with reduction of aerodynamic drag at higher speeds. The real problem for the Tango in this competition was being prepared with all of the data logging instrumentation and other requirements for passing the tech inspection. In addition, despite the fact that the Tango has nearly 200 lbs of lead ballast in the bottom of the battery box, because that was added voluntarily, the rules still required another 38 lbs of ballast to be added to make up for some of the production equipment not included (anti-lock brakes, air bags, etc), and the weight differential between my weight and 200 lbs. This was added to the front trailer hitch receiver in the form of a block of steel 3" x 4" x 11", just 4" off the ground in the front. Before leaving for Michigan for the X PRIZE Knockout event, my wife Alice and I had just completed a week long installation of a battery management system in Thomas Greither's Tango. This took place at Pacific EV in Seattle where we only got 2 to 4 hours of sleep a couple of the nights. Following the successful installation and delivery of the Tango with 32 kWhrs of Headway cells (120 mile range at 60 mph), we had very little time to install the new 10"-deep stainless battery box in the X PRIZE Tango. Tim Foster of Patriot Motors in Spokane volunteered his help with the installation which made it possible for me to make the solo drive to Michigan International Speedway in time not to be disqualified last Sunday. We are the only Progressive Automotive X PRIZE team with only one member. Upon arrival, with less than 2 hours of sleep for the whole drive towing the Tango and tool boxes, it was quite discouraging to feel so unprepared to have all of the new battery management system (BMS) modifications installed and the whole data acquisition system still in a box with the instructions still unread, plus a new 50 page booklet of rules, that it seemed there would be no way to make it through tech inspection, which would mean expulsion. I mentioned my discouragement to several of the X PRIZE staff, and to my amazement, several teams sent their team members to help. I feel like I was almost adopted by the Li-ion motors who had engineers and technicians helping to get the Tango prepped as if it was their own team. In particular, Luc Pham focused on the data acquisition system, while Abiyu Negede drew up a schematic for the relay board for the BMS and then soldered it up. I checked it out the next day to find it flawless. I hooked it up and the Elite Power Solutions BMS worked perfectly by shutting down the current on the charger at high cell voltage precisely while shutting down the AC input to the charger on over temp. It also shuts down the motor controller on either a low voltage or high temperature alarm. Davis Nguyen and others of the team were always there to help push the Tango to the Track, (a requirement for all cars), and all constantly available and asking to help. I owe the deepest debt of gratitude to all of them and other teams that also helped in any way. Brad with the FVT team helped immensely with the programming of the MoTeC dash to transmit to the data acquisition system. Their team is a direct competitor in our class, yet treated us as their own. The West Philly team was also helping by running errands to town for parts and even went to a steel company for me in Jackson, many miles away to bring back the ballast. The X PRIZE has been a great learning experience for all of us and seems that that is more important to all than who wins, despite the high stakes. This entry by Pietro Giovenco of Global-E first appeared on August 5, 2010. As a college student about to begin my career, it has been an incredible opportunity for me to be a part of Global-E and the X PRIZE competition. I am gaining crucial experience in the automotive industry that will undeniably help me in my career search. I have also had a part in an event that could very well serve as a turning point in the automotive industry and a wakeup call to the established automakers. If successful in its mission, X PRIZE will spawn a series of super-efficient vehicles that customers want to buy. This competition represents the forefront of engineering development, and it is an incredible opportunity for me to become an expert in technology that is rapidly maturing. My motivation for the development of efficient vehicles doesn’t come from an oil supply scare or a theory of global warming, but simply a belief that vehicle efficiency today is sub-par. Oil supply scares and theories of global warming are intangible threats and are not enough to force a substantial change in consumer behavior or the automotive industry. The real change will happen when organic engineering development teaches the consumer to expect 100MPGe without making any sacrifices. People survived just fine without internet, but nowadays the average person becomes nonfunctional if they lose connection. Because of this developed expectation, internet has even spread to the mobile phone for seamless connection to the abyss of information. The technology is present for super-efficient automobiles. Someone just needs to teach the consumer that they should expect it from every car they buy. Once the consumer expects these levels of efficiency, all of those issues of oil supply and global warming are washed away. My belief is that the natural development process will erase the intangible threats before those threats turn into realities. My proof is that I know there are people like me and companies like Global-E who have the ability to effect this change now. X PRIZE provides us the stage from which to speak and teach the consumer to expect more. Mahatma Gandhi was once quoted as saying, “Be the change you want to see in the world.” This is my change, this is my chance, and this is my desire.